Peter Laki is a musicologist originally from Hungary and now based in the United States, where he has served as Programme Annotator for the Cleveland Orchestra for the last ten years. He has studied Shostakovich extensively, most recently as a panelist at the Lincoln Center, New York City. The following is the text of a talk he gave at the Lincoln Center’s Shostakovich Symposium in February 2000. 1937 (the very next year). He redeemed himself with the successful premiere of the Fifth Symphony. 1940. He received his first Stalin Prize for his Piano Quintet. 1942. He was lionized after the first performance of his wartime Symphony No.7 (`Leningrad’). 1947. According to Laurel Fay’s new biography, Shostakovich and his family were provided with a Moscow apartment, as well as a dacha (a country home) `at the personal direction of Stalin.’ Of course, this also meant that he was put under pressure to make his home in Moscow, the capital, instead of his native Leningrad. The same year he was made a deputy in Parliament and, on the 30th anniversary of the October Revolution, he became a People’s Artist, a very high distinction. 1948 (the very next year) A second horrendous attack by the Party, condemning Shostakovich (and others, including Prokofiev) as `formalists.’ He was stripped of his functions and lost his teaching positions at both the Moscow and the Leningrad Conservatories. 1949 (the very next year) Shostakovich was sent to the United States to represent the Soviet Union at the Cultural and Scientific Congress for World Peace in New York. He also got two Stalin Prizes for film scores. 1962: The authorities tried to prevent the premiere of the 13th Symphony (`Babi Yar’), based on Yevgeniy Yevtushenko’s poem about the Nazis’ massacre of the Jews in the village of Babi Yar — at any rate, it was a sign of the changing times that the attempts to get the performance cancelled were indirect and the authorities stopped short of an outright ban. What is one to make of this seesaw of awards and condemnations? And, more importantly, how could a great artist function under such circumstances at all? The first question is, I think, easier to answer than the second. After all, Shostakovich was without a doubt the greatest composer the Soviet Union had (Prokofiev was a special case with his long years spent abroad) — the authorities needed him, which is why he was forgiven so quickly after both the 1936 and the 1948 debacles. So why was he attacked in the first place? Much has been written on that issue, but if I had to sum it up in one sentence, I’d say: Stalin wanted to show who was in charge. The second question is infinitely more complex. 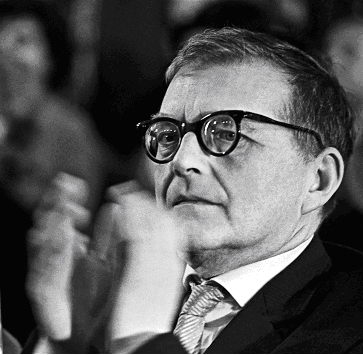 It is clear that Shostakovich constantly had to adapt to the changes in the political climate, but how did he reconcile that with the preservation of his artistic and personal integrity? Again, this is not so much a `dilemma’ than a determination to continue in any direction that hadn’t been blocked off. After the Lady Macbeth scandal, it became impossible for Shostakovich to write another opera; the history of the genre would certainly have been different had he been able to complete his projected trilogy. In general, despite all the official `forgiveness’ and all the Stalin Prizes and `Hero of Socialist Labor’ awards, Shostakovich was never the same after 1936. A tragic, brooding tone had emerged in his writing, becoming more and more predominant as the years went on, especially during his final years, marked by ill health. For a long time he concentrated mainly on instrumental forms with no texts to provide easy targets for attacks. His vocal works continued to be controversial, as the beautiful Jewish song cycle, From Jewish Folk Poetry and the 13th Symphony, when they weren’t openly propagandistic, as The Song of the Forests was. Finally, he found a medium that allowed him to transcend the constraints of politics: the string quartet, to which he turned increasingly after the end of the war. In theory, this was a potentially `regime-unfriendly’ pursuit, given the fact that quartets were considered a `Western’ genre, not exactly geared toward tremendous mass appeal and ever vulnerable to charges of `formalism.’ But by the end of Shostakovich’s life, none of that mattered any more. The tragedy is that by the time Shostakovich had reached a point where his universal status was no longer disputed, he had another enemy to contend with, one more merciless than politicians: his serious illness, which had an inevitable impact on his late music . (In this, too, there seems to be a parallel between Shostakovich and his closest spiritual heir, Alfred Schnittke.) The question as to whether Shostakovich was a `loyal son of the party’ or a `dissident,’ which has been so hotly debated in the United States for so long, doesn’t seem to be well put. Shostakovich no doubt accepted certain central tenets of the Communist ideology: first of all that the formerly disenfranchised, poor masses had to be given economic, political and cultural power. At the same time, he lost some very close friends in the Stalinist purges, including General Mikhail Tukhachevsky, and some much-admired collaborators, including the great theater director Vsevolod Meyerhold. So he knew only too well, from direct experience, that the Communist dream had turned into a nightmare. But he had no other dream to hold on to; and in the end he abandoned dreams altogether. I have known many people in Hungary who were in the same situation. They were disillusioned, yet they felt powerless to change anything and wary of those who tried. I have also known many who joined the Communist Party, as Shostakovich did in 1960, without any great conviction in the `Communist ideals’ (whatever those may have been at the given moment), for reasons ranging from coercion to convenience to it simply being `expected.’ Their views expressed at home at the kitchen table were often completely different from the speeches they were listening to (and sometimes, giving) at Party meetings. While such `duplicity’ seems reprehensible and is certainly a sign of moral weakness, open resistance would have been tantamount to artistic (and possibly even physical) suicide. There is ample evidence that Shostakovich did his `dissident’ work quietly, using his connections to help the families of the persecuted. By all accounts, he was supremely indifferent to all the official declarations that he signed, and he certainly did not regard those as the right yardstick by which to measure his moral integrity. 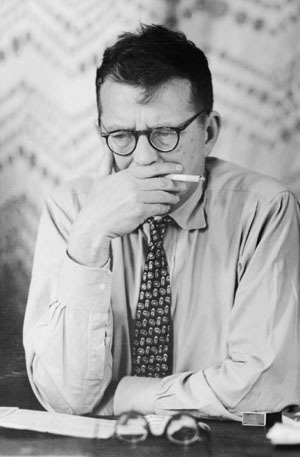 In recent years, many new documents have been published (Elizabeth Wilson’s book of recollections, Shostakovich’s letters to Isaak Glikman, and now Laurel Fay’s superb biography), which go a long way toward showing the complexity of Shostakovich’s thinking. It is a different matter entirely that those familiar only with his official statements have sometimes formed a regrettably one-sided view of the composer’s politics. In addition, it has been widely perceived that he did his `dissident’ work, first and foremost, in his music, although here we have to tread carefully since `dissident’ content is so hard to prove in music. Yet there are numerous moments where a biting irony, even sarcasm, is unmistakable, and one wonders how irony or sarcasm can be anything but subversive. The Scherzo of the 10th Symphony is a case in point, and that regardless of whether or not one believes it to be a portrait of Stalin. Whomever or whatever this music `portrays,’ it portrays it in a brutal and violent way, and whatever was on Shostakovich’s mind at the time of composition, it certainly wasn’t optimism or the belief that life was happy in this `best of all possible worlds.’ Now, to pick up a different thread in this tangle of interrelated issues, I would also like to point out how greatly Communist attitudes toward the arts had changed over the years. In the 1920s, when Shostakovich was young, under the cultural leadership of the enlightened Anatoly Lunacharsky, innovation was encouraged; it was believed that a new society needed new art. The tide turned in the 30s when Stalin put an end to all avantgarde experimentation and decreed that the people needed art they could understand. It was hard to disagree with that on the face of it, for what artist does not want to be understood by the audience? Yet the artist’s choices were severely limited in the process and many interesting initiatives nipped in the bud (to say nothing about depriving the audience of a chance to understand it later). It is a tribute to Shostakovich’s extraordinary talent that no limitations could prevent him from composing great music. Yet the impact of the political changes on his writing is frightening. Maybe there is enough time to illustrate that with two short excerpts. For virtually all his life, Shostakovich was writing (or was talking about writing) works to celebrate the October Revolution of 1917. More than a simple political expediency, this was a constantly renewed attempt on his part to come to terms with what was, for better or worse, the defining event of Russian history in the 20th century. He first approached that topic in his Second Symphony, subtitled `October’ (written in 1927 at age 21), in what must be regarded an extremely modern, avantgarde idiom for the time. 34 years later, at age 55, he wrote his Twelfth Symphony, subtitled `The Year 1917,’ in which he struck a much more classical, almost conservative tone. The two works, written on the same topic, could hardly be more different. Did Shostakovich make a concession to official taste? Did he betray his youthful ideals? Or are the differences between the two symphonies merely signs of maturing? It is clear that Shostakovich’s music would have turned out very differently had politics not intervened. Yet it is equally clear that his artistic journey, as it did evolve, has a certain internal logic of its own. Wars, hardships, repression and brutal criticism affected him but never stopped him from expressing himself in his music, though the artistic means may have changed. History dealt him a tough hand, but he not only did what he could but also, ultimately, what he had to do.